PSG have announced that they have officially joined the crowd-funding effort to help raise money needed to rebuild and refurnish the ruined parts of the Notre Dame cathedral, which was gutted by a dreadful fire on Monday. The club released a statement to announce that they are planning a “mobilisation” in conjunction with their sponsors and fans to help assist the campaign to restore the 850-year-old Gothic landmark. Foot Store have also pledged that €10 will be donated to the aforementioned crowd-funding mission for every Notre Dame flock they print, and have invited fans to come along to their outlet on Boulevard St Martin in Paris to take them up on the offer. He probably meant well, but still… yeesh. How good of them to capitalise on the destruction of their city’s history, no chance to make a buck goes to waste. How much for the shirt? £80 at least I’d say. Only 10 goes to the charity. You can bring your own shirt in if you already have one. The printing is free. 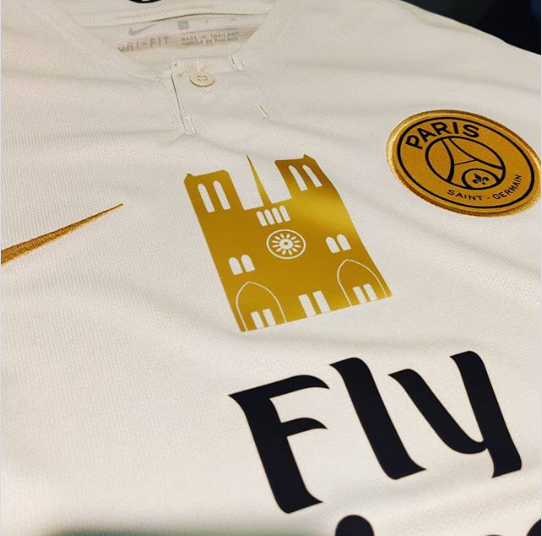 By PSG, you mean the Qatar Royal Family and Mr. Nasser Al-Khelaifi right? PSG are a disgrace to football. What they did to the transfer market by paying 300m for one player is just ridiculous. I hope they need support one day and I hope nobody is there to help them. Cocksuckers!